Heading out on Wednesday in our new boat with 14 other identical boats was quite a thrill. A large contingent of the PDQ staff came out to see us off. The wind had been blowing hard for the previous few days so the lake was still pretty rough, but all fifteen of us forged ahead to Cobourg, some 30 miles east of Whitby. Here, once again, PDQ treated us to a farewell feast. We were really in no hurry to leave after the VIP treatment we’d received in Whitby over the past four days! Departing Cobourg Thursday morning, six boats headed out across the lake toward Oswego, while the rest of us headed east to the Murray Canal – which PDQ arranged to have open a day early for our arrival! 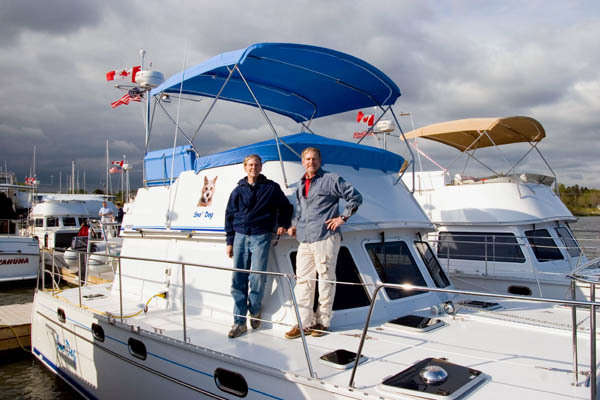 Once through, three boats turned off to Trenton to begin the Trent-Severn Waterway (headed for points West) while the remaining six of us headed on through the Bay of Quinte to Kingston where we stayed at the City Marina - for free, as it had not yet opened for the season. Friday morning we headed up the Cataraqui River to the first set of locks on the Rideau Waterway. Because of our beam, and the fact that these locks are essentially unchanged since they opened in 1835, only two PDQ-34’s can fit at a time, so getting all six of us through is a slow process. The Waterway turned out to be quite spectacular despite a few bouts of rain, wind and cold weather. The rain over the last few days caused another problem as well; the locks are flooded east of Smith Falls - and they are still closed as I write this. We are presently (and pleasantly) stuck in the town of Westport waiting for the water level to fall. 4 pages of photos are now up! The trip was great! The boat worked flawlessly! It’s amazing to me that, with so many complicated systems, things worked as well as they did. As far as I know, all 30 engines and 15 generators performed perfectly. While still at the PDQ docks in Whitby, owners were given a “Punch List” to note any discrepancies they found. Each day, they checked our lists - and the problems magically disappeared! For our group, this actually continued for six days into the Flotilla as James (& Jackie) Power came along to assist and fix anything that needed fixin'. Our list was very short: a couple of switches installed upside-down, a non-functioning autopilot remote and a burnt-out courtesy light. Also, the fan in our cabin heater (which works off the engine) died after a couple days. Unfazed, James had a complete new unit sent to Smith Falls where he was able to install it while we waited for the next lock to open! (Naturally the weather warmed up immediately afterward, so we’ve had little need of the heater since). Another feat accomplished by James (with a little help from other PDQ personalities) was the replacement of an apparently defective refrigerator. I was amazed to see that the complete unit can be removed through the opening center front window! I later commented to Simon (Slater, PDQ CEO who joined our Flotilla in Smith Falls) that I found their service to be quite remarkable. He said this was no accident, most of their sales are by word-of-mouth. They put much of their effort (and money) into customer service rather than into advertising. Sounds good to me! 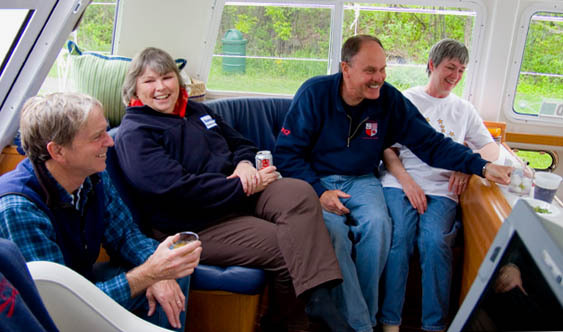 06/10/06 – I'm writing this in Burlington, VT. We've now completed the PDQ Rideau Waterway Flotilla to this point. (To see more photos of our trip click here). The other boats have continued south through the Champlain Canal, into the Hudson River and onward toward New York City. We plan to do this next week – eventually arriving at our summer homeport of Portsmouth, NH in a couple of weeks.. Some other projects included installing our bow numbers (we’re registered in NH) and, of course, a flag staff for the Sno’ Dog pennant. Then it was time for PDQ-U – two days of intense learning about our new boats. I have nothing but the highest praise for this effort on the part of PDQ, every aspect was excellent and taught by folks who really knew their stuff.